So I've finally settled on a new layout and made a header which I have very proud of (even if I do say so myself). So now its back to blogging- honestly I have so much to blog, I may be blogging all weekend. Going to be quick here cause I am about to dash and get some food. 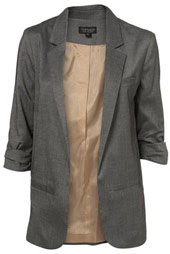 I am fond of a blazer and I need this Topshop bad boy in my life. Good job its payday on Tuesday!! !